My start time was at the entirely reasonable 8 AM (I can’t even imagine some of the people starting at midnight!) so I made sure to wake up at 7:30, to have time to get into cozy cardigan and socks, get breakfast, and more importantly have my first cup of coffee. I settled in on the couch with my first book and my various tech gadgets, intending to start my book and maybe take a leisurely break to blog and Tweet as I went, participating in a few memes and putting my posts into 4 hour blocks to save the update feeds of my non-Readathon friends. 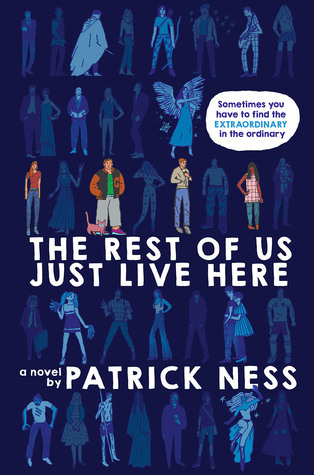 I opened up The Rest of Us Just Live Here, by Patrick Ness. And then it was 11 AM. And I had finished the entire book. Yes, I took breaks. This book was the perfect kind of good: engrossing and wonderful, but also so good that I had to stop after every couple of chapters to marvel at just how good it was. I might actually take an entire break from reading, just to write this the proper, gushing over details review that it deserves. It was a perfect blend of scifi and normal, and of normal teenagers reacting and snarking about having scifi oddness intrude on their normal high school lives. I kept giggling at funny, wise, really true turns of phrase. It was like Buffy the Vampire Slayer at its very absolute best. Funny, and with monsters. But also heartfelt and true about people and being a teenager. This is the kind of good book I want to re-read immediately, and the kind of book that has me questioning all the 5-star reviews I may ever have given a book on Goodreads, ever. Erm, I think I just reviewed the book. Heh. Oops. On the plus side, taking a break for a mini-review and browsing the Dewey blog has, I think, held off the book-hangover that would have otherwise made getting into my next book a big letdown, after such a strong start. Also, I missed the intro meme entirely. But, behold my reading pile and the view from where I now sit, mug of coffee and tasty peanut butter cookies close to hand. Yes, that’s a graveyard. On the other side of the kitchen, Dad is starting to fry up sausages and open jars of tomato sauce for the concoction of Daddy-Pasta sauce, which will be bubbling away as I read my next book. What will my next book be? Hm, good question. Possibly Smoke Gets in Your Eyes, a memoir about working in a crematorium. Or possibly something on my Kindle. Not sure yet. I really like your book choices for the readathon. And my, you do read fast. I’m looking forward to your review of Smoke Gets in Your Eyes.